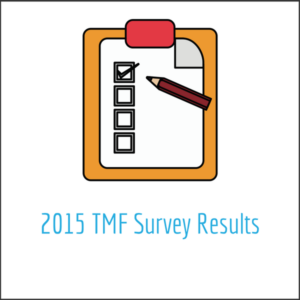 The Trial Master File Reference Model (TMF RM) team conducted the fifth annual TMF RM Survey from May to July 2015. The survey results were published last week and I would like to share with you some very interesting data about current TMF practices. As a sub-committee member of the TMF RM initiative, I enjoyed working with other industry professionals to develop and conduct this important survey. We collected and analyzed data from 159 evaluable responses (down from 231 in 2014). Most of the respondents—53% to be exact—are from Sponsor organizations located primarily in the USA and Canada. TMF metrics – one of my personal favorites! eISF (electronic Investigator Site File) – new and very hot topic! Fortunately, 62% of the respondents consistently follow a TMF Standard Operating Procedure (SOP). If you do not have an SOP, I highly recommend putting one in place as soon as possible because SOPs play an important role. Your SOP is what you will be inspected against (as well as regulatory requirements) during a regulatory inspection or an audit. Most of the respondents are either currently utilizing an eTMF system (44%) or actively building or implementing one (18%). Interestingly enough, these are similar numbers to last year’s. What is not surprising though (at least not to me) is that utilizing an eTMF system is still fairly new: only 46% have had an eTMF in production for 2-3 years. I am glad to report that the majority of the respondents (58%) are not using more than one eTMF system. For those that do, the most common issue is an increase in effort for reconciliation. From personal experience, it can be cumbersome looking for a document in more than one place. And, can you imagine doing this during an inspection? Not fun! Almost all of the respondents—a whopping 96%—retain paper mainly for wet ink signatures. Metrics—my personal favorite as I am leading the cross-industry TMF initiative for the Metrics Champion Consortium. Metrics is a core competency for LMK Clinical Research Consulting, LLC. What surprises me the most about the responses for this question is that only 28% of respondents have a metrics program in place. Because 44% are utilizing an eTMF system and with the sophistication of the eTMF systems, I expect these numbers to be more aligned. Of the 28% that do have a metrics program, they are using it to measure TMF completeness and metadata (fancy word for document) quality. 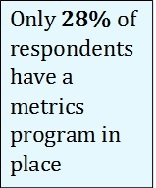 The other surprising part about metrics is that 62% of the respondents do not measure TMF costs. If you don’t, please tell me why! Of the 38% that do measure cost, only 10% state that it is very cost efficient. I definitely think that this number should be much higher. And, for one of the most exciting responses—drum roll please—43% are going to use TMF metrics in their Risk Based Monitoring Program in the future. Most people are aware of the TMF RM; for the 4% of respondents that did not know about it, now you do! 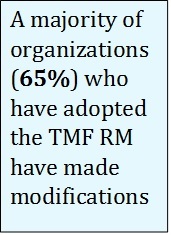 Of the 71% that are using the TMF RM, 54% are using it for both paper and eTMF. This is great news especially for the respondents that are using it for paper and planning on implementing an eTMF system in the future. I always advise our clients to implement the TMF RM before migrating documents into their eTMF system. The majority of organizations (65%) who have adopted the TMF RM made modifications to it, which is highly recommend because the TMF RM is meant to be a reference, and should be used as such. The main reason for making modifications is adding artifacts—not surprising according to the survey. Prior to implementation, a company’s SOPs should be mapped to the TMF RM before it is used. Over 70% of the respondents have more than 201 document types in their index (i.e. Table of Contents), no wonder people are so confused about how to file documents. Yikes! Although eTMF usage is fairly new, many of the respondents—30% to be exact—have had regulatory agencies inspections of their eTMF system (eg, FDA, MHRA, and PMDA). The good news is that the regulatory authorities are on board! In general, they are not refusing to review the eTMF documents and requiring paper documents (phew!). eTMFs help to ease the burden of audits and inspections according to 75% of the respondents. At least there is some relief. Also, 32% report that eTMFs are beneficial in support of unannounced inspection. With the newest and hottest topic—the eISF—responses are just as interesting. Only 8% of respondents are currently externalizing content to sites (eg, Investigator Portal) although 24% are evaluating this route. This is a good idea especially for the Study Start-Up groups. Can we finally say goodbye to those Reg Pack emails or even worse sending them in the mail? Most of the respondents (74%) are not utilizing an eISF in their studies. For those (<25%) who are utilizing an eISF, 71% use the sponsor’s technology and 16% use the sites’. Congratulations to all of these forward‑thinking sites! Overall, we received some very insightful information from you that will help us to improve the TMF RM. The results are very interesting and let us know that while technology has improved our processes, there is still a lot of work to be done. I look forward to next year’s survey!